These private tours are ideal if you are staying in Calgary for a few nights during the winter time and would like to get out to explore the great outdoors. With Banff National Park right on your doorstep, a visit to the magnificent Canadian Rockies is a must! 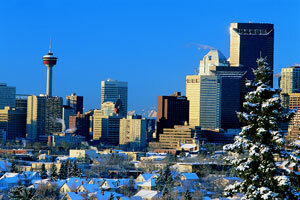 Listed opposite are the available winter tours and activities to choose from which depart out of Calgary. Click on the links for more information or check out some of our advice on Calgary winter tours below. When you are ready to book, just contact us. Calgary Ice Walk Tours give you a unique view from inside both Johnston and Grotto Canyons. There is more ice walking involved with the Grotto Canyon tour in comparison to the Johnston Canyon tour. See the Calgary Flames play! The Calgary Saddledome is easily accessed by the Calgary LRT (light rail transit) from downtown Calgary. Calgary to Banff Day Tour will give you a taster of what the spectacular Canadian Rockies have to offer. Taking a guided Calgary Kananaskis Snowshoe Tour is the safest option to go for an enjoyable stroll in the snowy wilderness. These modern snowshoes have come a long way since the old tennis-racquet styling! The Canmore Hike and Banff Skate tour will take you up to Canmore's Grassi Lakes and you have the opportunity to skate in Banff afterwards. If the Calgary winter tour you are interested in is not listed above, please contact us and we will do our best to help. Banff is about 1.5 hours drive away from Calgary International Airport and getting to Banff has never been easier with our scheduled and private airport transfers. Take an extended overnight Banff tour from Calgary. Banff accommodation is less than you might think! The Canadian Rockies is an ideal getaway for your corporate group. If you are basing your meetings in Calgary, then take a break, and let us organise a quick getaway into the Rockies for the day. We have access to tour vehicles with up to 57-seats. Please contact us and we would be happy to send through more information.